While the exact cause remains a mystery, research has revealed four key players — excess oil, clogged pores, bacteria and inflammation. The excess oil is sebum, an oil that our bodies make to prevent the skin from drying out. Sebum increases dramatically during adolescence when hormones known as androgens spur sebum production into overdrive. Not all of the excess sebum can flow freely to the skin’s surface, and clogged pores result. Propionibacterium acnes (P. acnes), bacteria found on everyone’s skin, flourishes in the excess oil and causes inflammation. Inflammation determines what type of acne appears. A little inflammation means that sebum flow is blocked close to the skin’s surface. The result is a blackhead or whitehead. Your dermatologist may call this a “comedo.” If the blockage develops deeper within the skin, a papule (pimple) forms. A bit deeper and a pustule (pus-filled pimple) develops. A very deep blockage causes intense inflammation, resulting in a painful nodule or cyst. 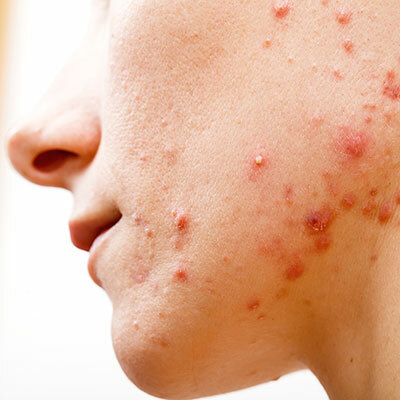 Nodules and cysts are the most severe types of acne lesions. Waiting for acne to clear on its own can be frustrating. It can also lead to permanent scarring, poor self-image, depression and anxiety. To avoid these physical and emotional scars, dermatologists recommend that acne be properly treated. Treatment results may take time because the treatments do not target existing breakouts (which clear unaided), but work to prevent new eruptions. While waiting for treatment to work, it can be tempting to squeeze acne lesions to get rid of them. Dermatologists do not recommend this. Picking, scratching, popping and squeezing tend to make acne worse and can cause scars. Treatment plans will vary depending on many factors including gender, age and acne severity. Women who are pregnant, nursing or trying to become pregnant will have additional considerations. Acne is not curable, but it is controllable. Proper treatment can prevent acne scars and help you to feel and look your best. Seeing your dermatologist or dermatology physician assistant helps to ensure that you are getting exceptional acne care. To learn more, visit the American Academy of Dermatology’s website.